The race teams needed a little R&R (rest & relaxation), so we got together for a trip to Daytona, Florida for the Rolex 24 hour race. The trip was the brainstorm of Mark Summers (Red #88 GTO Camaro) who thought it would be good fun for a "guys" weekend at the Rolex 24-hour race at Daytona Speedway. The only problem was that Mike wasn't going without me, especially since I've been begging him for about 10 years to take me to Daytona to watch the 24-hour race from the infield. So I was the only girl - which isn't a big deal because when you race with the guys, you are one of the guys. The players on this weekend, besides Mike and I, are Mark Summers (a/k/a Mr. Summers in the important circles), Chris Wilken (Red #01 GTO Corvette), Johnny Walter (Yellow #98 Super Production Corvette) and his son - John Walter, Robbie Poupart, three of Mark's friends who I will name by nicknames for their protection - Tater, Herm & Chim-Chim, the pilot - Ben, and his co-pilot - Jim. Mark's "original" idea was to have everyone take the 1.5 hour flight on his family's private jet on Friday (25th) after work and come back on Sunday (27th) right after the race. Mark has a very nice, very big motor home and it wasn't long before Mike & Chris were volunteering to leave a day earlier and drive the motor home to Daytona so we would have it parked in the infield. Everyone else planned to meet at 5:00 p.m. on Friday at the airport in Slidell, LA where the jet is kept in a private hangar. Somewhere along the way, I realized part of the true beauty of flying on a private jet. No security! No luggage restrictions! No lines! No time schedules! And no one would be left behind if they arrived a few minutes late! I was the first to arrive 'cause if anyone was going to be late, it wasn't going to be me! I met the pilot standing on the steps in the open hatchway and, after introductions, he came to my car, took my luggage and got it ready to be put on board. He instructed me to park the Corvette inside the hangar. Sweet! Secure parking for the weekend! Everyone arrived within the next 30 minutes and we were boarded and off the ground just after 5:00 p.m. We hadn't been in the air 5 minutes when I realized another great thing about flying on a private jet. No alcohol or drink restrictions! The Crown was flowing and everyone was getting pretty wound up about going to Daytona. We moved around the plane swapping seats, getting to know "the new guys" and generally cuttin' up. We were all about half hammered by the time the jet touched the ground in Daytona! We deplaned on the tarmac near the terminal and transferred our luggage to the Ford Excursion that was waiting for us. Another car was waiting for the flight crew. I made a cell phone call to Mike & Chris to let them know we were on the ground. They saw a jet land at the time we should have been arriving and were already making their way to the front gates to meet us. We picked them up outside the gates and Robbie drove us to dinner at a restaurant highly recommended by Chris. A round of drinks were ordered along with some great food and we started to catch up on the travel stories. We got the story from Mike & Chris about how they parked the motor home inside the track a day earlier than they were supposed to. They arrived at the track around 9:00 a.m. on Friday morning to pick up all the tickets and pulled up at the gate to the infield because they didn't know where to leave the motor home. They told the gate personnel that they weren't sure where they were supposed to park, but "Mr. Summers" told them to bring the bus to the infield. When asked as to Mr. Summers' whereabouts, they responded that Mr. Summers was flying in on his jet later that evening and they had instructions to have the motor home set up and waiting for him. The attendant then ordered them to follow him and to park exactly where he told them and to stay put. They were then promptly escorted to a very nice spot in an area that had the hairpin on one side the the high banks on the other. Mr. Summers must have some clout! After dinner, we made a fast run through the grocery store to get additional items for meals, snacks and drinks followed by a stop at a liquor store. Some members of our group don't remember being in the grocery store and I'm not sure they remember being in the liquor store either! The next stop was the hotel near the track where most of the group got dropped off. 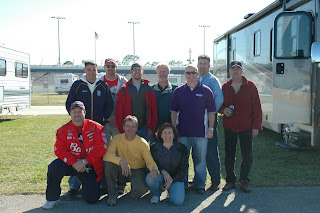 Chris then brought Mike, Robbie & I to the motor home inside the track. He would be back in the morning after breakfast. Being too excited to rest, the three of us walked all over the infield getting the "lay of the land" checking out where everything was located and seeing the campfires being stoked by other campers trying to keep warm. It was well after 1:00 a.m. before we settled down in the motor home to get some sleep. I was too excited and kept looking out of the window near the bed from which I could see the ferris wheel and other rides in the infield that stayed lit up all night. In total, I took several little naps that only added up to a couple of hours of sleep that night. It was very early (before 7:30 a.m.) on Saturday morning when there was a knock at the door from Chris, Johnny & John. They got an early start and had breakfast while Mark and the rest of the crew were still passed out in their hotel room. Chris went back out a little while later to pick up Mark and would go back out of the track again around 11-12:00 to get the rest of the guys and shuttle them back to the motor home. We walked all over the grounds and garage area. All qualifying and practice sessions were completed on Friday and they were just making last minute adjustments prior to going to the grid pre-race. We went to the Fan Zone and also checked out the other infield displays by Pontiac, Toyota and Mazda. There was a short exhibition race of the historic cars prior to the pre-race festivities that started at 1:00 p.m. The Daytona Prototypes (DP) and Grand Touring (GT) cars, 66 in all, rolled out of grid at 1:30 p.m. with an overhead fighter jet fly-by after the national anthem was sung. I filmed the start from the top of the motor home while others went to the International Corner to shoot photos of the cars on their first time by in a group. It was AWESOME! The atmosphere was super-charged! We whooped and hollered from the top of the motor home. The next 24 hours were spent watching the most exciting racing I've seen in a long time. We watched from the stands, from atop the motor home, from behind the hot pits, and anywhere else we were. The race was on the big TV inside the motor home and on the smaller TV that slid out from one of the outside storage compartments. And, needless to say, we drank - a lot! Tater cooked some hot dogs & brats on the grill on Saturday afternoon and I whipped up a big pot of jambalaya for Saturday night. Before dinner, Chris, Robbie & I rode the ferris wheel which gave a great view especially when the operator stopped us at the top. Then we rode a wild ride that moved like a pendulum and spun us around in the process. Who was it that screamed like a girl?! We were dizzy when we got off which is why we rode before dinner! Ben & Jim (pilot & co-pilot) also came by to visit us, eat some jambalaya and watch a bit of racing. Around 11:00 p.m., Mike, Robbie, Johnny, John, Mark and I walked over to the garage area. Things were hopping! Several teams came into the garage to make repairs that could not be made during a pit stop. The DP cars were doing all sorts of work. We watched the Kodak team change an axel shaft and hub. The Lowes/Gainsco team changed a gear set. We watched as several of the GT Porsche teams came in for service. The high-buck teams replaced major parts in a matter of minutes while the low-buck teams removed the broken parts, repaired and replaced them. The DP car sponsored by Dress for Less came into the garage with a broken rear differential. Unfortunately, they were now out of the race because the crew had no parts to change or make a repair. It was early in the morning hours when everyone who had not gone back to the hotel was finding a place to settle down for the night. Soon it was "snoresville" and everyone was sleeping but me. I was just too excited to sleep! I wanted to go back outside, but it was very chilly and damp and then a short hard shower came down. No matter, I curled up on the sofa in the front of the motor home by a window where I could see a little piece of the track and the cars going past. I kept thinking, "I'm missing it! I'm missing the racing!" I stayed awake all night looking out of the window occasionally dozing for a few minutes here or there. Chris came by early and picked up Mark for breakfast. I grabbed about an hour of sleep from about 6:00-7:00 a.m. before getting up to fix some coffee and "fast food" breakfast. Once everyone had showered, checked out of their hotel and returned to the track, we walked through the infield back to the garages to see what got destroyed during the night when we weren't watching and who was out of the race. We browsed the souvenier trailers and bought some shirts and stuff. Our ticket package gave us a free Rolex 24 hat which was cool. We watched the last couple of hours of the race from the stands at the hairpin. It was exciting 'cause it was a good passing zone if the cars stayed on the track. The cars were filthy dirty, some were barely running and either missing body parts or the tape that was holding parts on was flapping in the wind. The Telmex team of Scott Pruett/Memo Rojas/Juan Pablo Montoya/Dario Franchitti won for the 3rd time in a row in the DP Lexus Riley. Second place went to the Lowes/Gainsco team of Jon Fogarty/Alex Gurney/Jimmy Vasser/Jimmie Johnson driving a DP Pontiac Riley; and third place went to the team of Ryan Briscoe/Helio Castroneves/Kurt Busch driving a DP Pontiac Riley sponsored by Toshiba. The GT class was won by the Castrol/Mazdaspeed Mazda RX-8 team of David Haskell/Sylvain Tremblay/Nick Ham/Raphael Matos that also placed 9th overall. Actor Patrick Dempsey (from Grey's Anatomy) was driving a GT Mazda RX-8 sponsored by Hyper Sport/Sobe Life Water that finished in 39th position but was still running at the end of the race. It took only 30 minutes to pack up the motor home and get ready to pull it out of the track. We took a few photos before we piled into the Excursion to head for the airport with Chris & Mike in the motor home behind us. The trip home on the jet was pretty quiet. I think everyone was pretty wiped out but still smiling from ear to ear. We left the Daytona Airport around 3:00 p.m. and I was home in my jammies ready for a long nap by 5:00 p.m. Mike didn't get home until after midnight after co-driving with Chris to bring the motor home back. What a great trip! A huge "THANKS" goes to our friend and teammate, Mark Summers, for inviting us on a first class trip - its the only way to go! Check out the slideshow over on the left of the page. It is only "some" of the photos taken by Johnny Walter and Mike Poupart.